Is AlphaSphere me the MIDI controller for you? 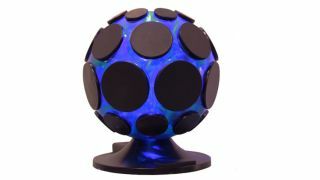 nu desine's spherical AlphaSphere controller is certainly eye-catching, but with the most affordable model having previously cost £678 (the AlphaSphere Nexus), it's not something that most of us would have taken a punt on. However, we now have the £150 AlphaSphere me to consider. This has a similar design to its big brothers, but puts 32 rather than 48 pressure and velocity-sensitive pads onto the central 'ball'. These can be mapped however you like, with the hexagonal design allowing for various notational arrangements. You can find out more on the AlphaSphere website, where you can also pre-order the AlphaSphere me for shipping in Spring.